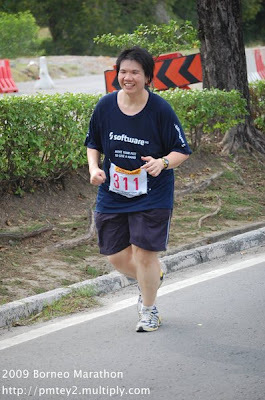 She is my running mate, since im started to run 10km, and subsequent 20km, im always with her and others. Congratulation to her. i wish my 1st ever Standard Chartered Singapore full marathon 42.195km can achieve timing below 5hr 30minutes. Here are my friend story! 3. Friendly and supportive volunteers, including the police! I indulged into binging again after KL Marthon. The weight gain had scared me away from training, I even skipped Adidas King of the Road in early August because I had no confidence at all to run the 20km+ distance. Fortunately I pulled myself back to track in September, started to watch the diet again and slowly get back into training. However, there was only about a month to go, even though I had logged the highest mileage in September (217.7km), I only attempted once to run 25K but walked mostly the last 5K. So I had very low expectation in this race: run 20km + walk 20km, and finishing it within the official cut off time of 7 hours, I would be more than happy. I reached KK on Thursday with a group of running friends. Thanks to a local running friend, we had a wonderful time doing sight-seeings around KK, I must say Sabah is really a gifted place with lots of natural attractions! This was my second visit to Sabah within the same year but there were still plenty of places that I had not visited yet. I did well by starting slowly and not being influenced by other runners. My pace was controlled and the breath was very comfortable. When I spot the first distance marker at 7km, I was shocked to learn that it was only 46min+, in another words I was doing less than 7min per km! On the other hand, I did not feel huffing puffing too much and still had a lot of energies! I slowed down slightly but still doing quite well with merely 1:06+ at 10km. I guessed this was the first time I could maintain less than 7min per km for 10km without being breathless! I really wanted to thank the running buddies, who accompanied me running numerous times of double hills in early weekday mornings before going to work, we were crazy people! The Borneo Marathon was a cozy event with small number of runners (about 200+ full marathon participants), it was comfortable and I did not feel the stuffiness like in Singapore Marathon. One side of the road was entirely blocked for the runners, I felt like I was really the king of the road when running alone in the middle of the road! In addition, big kudos to the friendly and supportive volunteers, their face was always hung with sincere smile and they were not stingy in giving inspirational cheers to fellow runners. Took a banana at 28km. Yes, I was still "running" at this point. I only started walking at 32km, was very proud of this achievement. But I didn't walk too long each time. Usually I would picked up running again after a few minutes of walking. I believed I walked less than 3km for the entire course, I had run 39km+! What a record! The weather was getting hotter, I started to pour water to my head whenever possible. At 38km, I was craving for my favorite drink: Ribena. I went to a nearby petrol station, but this station was very small and did not sell Ribena, so I settled to a can of my second favorite drink: Milo. Only 4k to go, I kept running with couple of short walking breaks. At ~40Km, I felt like walking again, but the KL runners who were stuck in the traffic jam on the other side of the road cheered me very loudly... NO, I could not walk now, I must run, run towards the finishing line! Finally I reached the stadium but still half lap to go (200m?) on the track, this was really a mental torture, so near and yet so far... LOL. My running buddy was waiting to snap my finishing photo, and yes, I did it! My watch recorded 5:15:24, while the official result was 5:15:35. Who cares the 11 seconds difference, I had made a remarkable personal best record! Previosly I did 5:53 in Singapore Marathon and 5:58 in KL Marathon, I had improved by more than 35min! You see, I really enjoyed the run!